The idea of homemaking has become something that people – enlightened people – often mock. Any woman who states that she enjoys homemaking or wants to be primarily a homemaker is viewed with suspicion or derision. I really don’t understand that. Homemaking is one of the best gifts you can give to yourself and your loved ones that costs virtually nothing. Even if you have a career or work from home, you can still embrace homemaking. There is absolutely no reason a woman cannot be skilled in both a career area and homemaking. It is not an either-or proposition. It can be a both-and. Homemaking is making a home. It’s really that simple. I’m not sure why that is even remotely controversial, but apparently it is for some. Homemaking is not housekeeping. Housekeeping can be hired out. Homemaking cannot. Someone else can come in and clean my house which may help me free up my time for other aspects of homemaking, but a housekeeper can never make a home for my family or yours. Making a home means creating a place where you and your loved ones can feel at peace and enjoy the opportunity to be the people you were created to be. How much time a woman can invest in homemaking will depend on her individual life – her working status, the ages of her children, whether or not she homeschools, etc. But we can all make a home in at least small ways. What it will look like will vary from family to family. My home isn’t going to look like yours and yours isn’t going to look like mine. The important thing is that your home and mine meet the deepest needs of our loved ones. 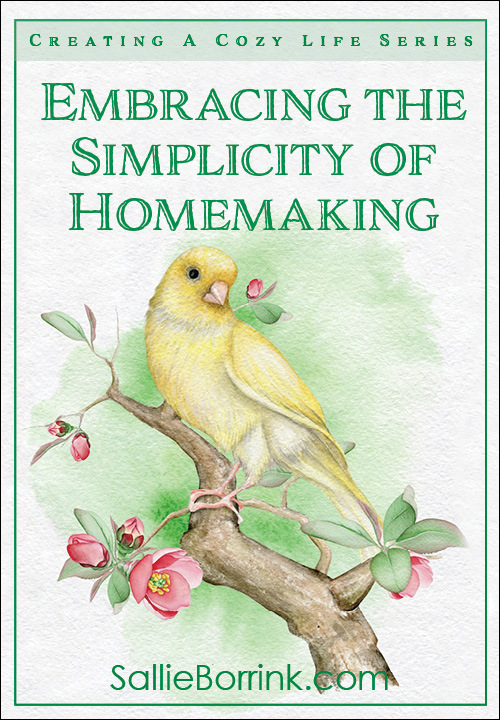 How can we practice homemaking in some simple ways? I think it’s easier to think about if we break it down according to the five senses. What do you eat in your home? Those are basic questions that can shape your homemaking. Does your home look welcoming, comfortable, and peaceful for your loved ones? Does your home smell fresh and good? Does your home sound homey? Is your home filled with textures and materials that help people relax, gather, and enjoy peace? Is your home filled with good food that meets the nutritional needs of your loved ones? That is homemaking. Creating a home where people can enjoy being together and their five senses are filled with good things. Homemaking is not a competition. Homemaking is not a performance. Homemaking is not a way to measure our worth or value as women. It’s simply keeping a place where we and our loved ones can feel peace, understanding, and joy. Our homemaking efforts will vary depending on the season of life we are in. When you have an infant in the house, homemaking is more about keeping the baby fed and dry while keeping everyone else in the house fed and alive. 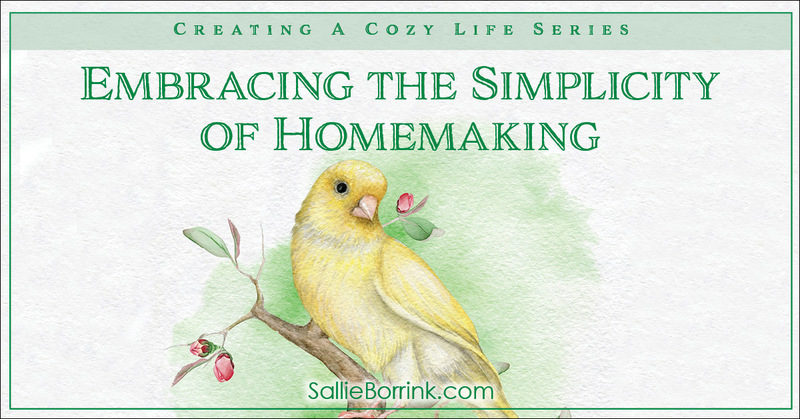 As we progress through different seasons of life we do our homemaking differently. One way or season is not better than the other. As long as we are intentionally caring for our loved ones in meaningful ways, we are making a home. That is homemaking. 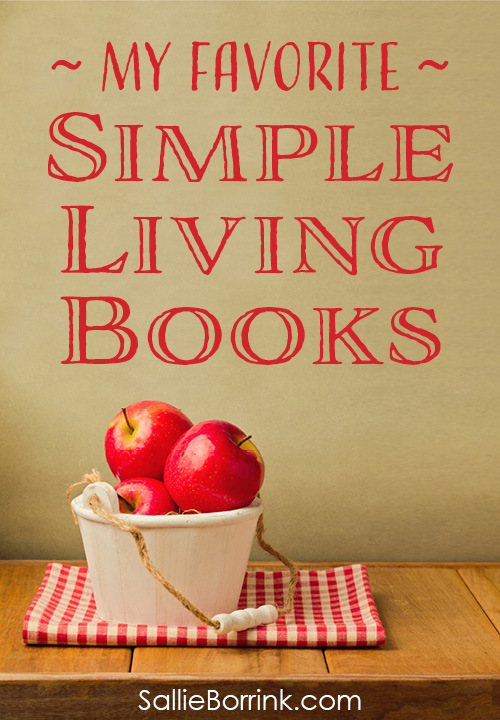 I invite you to download Embracing the Simplicity of Homemaking below and use the included page to begin developing a plan. Please don’t feel condemned or guilty if your homemaking endeavors haven’t lived up to your ideal or what you think other people might expect. This is for you and your loved ones. I’m so glad you enjoyed the download. I have to admit this is one of my favorite posts and downloads I’ve created because I feel so strongly about it. Thanks for the download! Loved the article. I have never understood why people think it makes a woman less of a person. You are very welcome! I’m glad you enjoyed the post and the download. I don’t get it either. Every woman who has people to love and care for can make a home for them. That’s homemaking. It’s really that simple – and lovely.